Club Penguin Cheats by Mimo777 Club Penguin Cheats by Mimo777: Club Penguin Protobot Message! 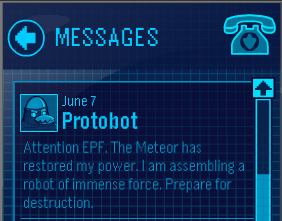 Protobot has sent us a new Club Penguin message! Whoa! If the Meteor can do that for Protobot, what do you think it can do for us... OR HERBERT? In CP's mascot files, two new characters (CeCe and Rocky from Shake it Up) were found. Could you post this on your blog? I'm not sure if you know how to get in these files but if you do, please post this VERY exclusive news. They may be bringing Shake it Up to the Music Jam next month! That's a good point Mimo! The meteor could really help us or Herbert!!! We might be in trouble later! Bzzzzt! This is one of the Protobots here. You shall never win penguins! Its a bug bobawasome,also they update the telescope. but sometimes they forget.